Cold Air Currents: Ontario's outlaw Premier "will will discover that there is no juice to be squeezed from Hydro One"
Ontario's outlaw Premier "will will discover that there is no juice to be squeezed from Hydro One"
Tom Adams and Mike Hilson have a column in the Financial Post today which cites one of my works. Ontario’s Outlaw Premier Plots to plunder Hydro One is the work of mine that is cited in today's column. It's on my Wordpress site, which I'm using increasingly for posts I want to start and finish in the same sitting, perhaps leading to more analysis on my main Cold Air blog. In this instance you may want to read the post as background for the work by Adams and Hilson - theirs is the broader piece I'd hoped to have written on the topic. Actually, that should be topics. Even if the legislation was silent on the disposition of sale of Hydro One assets or if that legislation was repealed, the taxpayers would still be on the hook for all of OEFC’s liabilities. Today, the book value of Hydro One is included as a financial asset in the government accounts. Any dilution of this interest would decrease the value of the investment. To avoid increasing the Province’s net debt, the proceeds of any sale would have to discharge existing debt. Only any premium over book value could be claimed as a gain, but the prospects for such a premium don’t look promising. Similar questions arise with respect to Hydro One’s regulatory assets. Former teacher’s pension fund manager Jim Leech in his August report found the pension to be under water but all that is treated as an asset to be recovered in future rate increases. With power demand already retreating in the face of punishing rates, how solid are assumptions about future regulatory decisions to recover costs incurred to date but left for later recovery? This idea of liabilities as assets should have become more common knowledge after the smart meter program was in the news following The Auditor General's 2014 Annual Report. Long story short, the auditor claimed the program cost $1.9 billion while the Minister of Energy claimed it was $1.4 billion - and they probably didn't disagree very much on the actual figures. The difference being the liability as asset manoeuvre utilities have. The Auditor showed a $400 million cost of "Scrapping conventional analog meters." 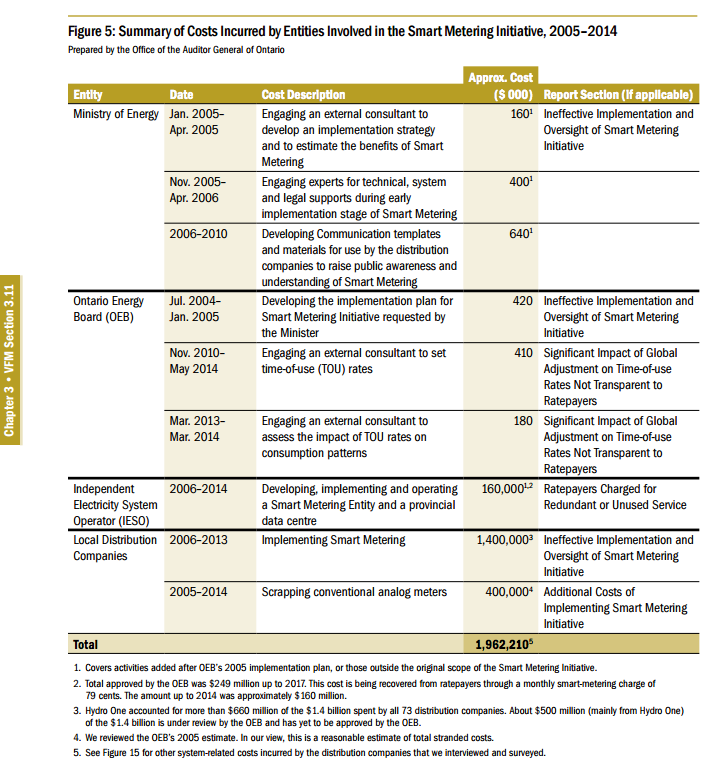 The net book value of stranded meters related to the deployment of smart meters has been reclassified from [Property Plant and Equipment] to regulatory assets, resulting in an increase in regulatory assets of $17,362,000 and a decrease in [Property Plant and Equipment] of $17,362,000 ... LDC expects to apply to the OEB for recovery of the remaining stranded meters costs as part of its 2015 electricity distribution rates application. Things of value are one asset type (Property Plant and Equipment); things of no value are a different asset type. Just an observation on the transportation file -- note in the graph the tiny emissions from rail, which carry a very large portion of freight in Canada, compared to transport fuels. And personal vehicles, think Don Valley Parking Lot at 'rush' hour or downtown without the Gardiner -- contrast with Tokyo moving millions of people by rail every day or the network of abandoned rail stations covering rural Ontario (everywhere but Toronto). Why is it that Canada, unlike most other industrial nations, is ripping out the energy efficient transport systems? And electric cars in this climate with power prices rising at 5x the general inflation rate?